Well, the kids are officially with their grandparents/cousins for the next two weeks. This starts the beginning of a crazy two weeks for Tony and I work wise, so the kids are having their vacation time away from our boring time! It's so strange, I love having this time with just Tony, but I also miss the heck out of those silly boys the second we drove away from them. I know this is good for them though. I remember spending time at my grandmother's house with my cousin during the summer and it was always such a blast. You get away with a lot more too! 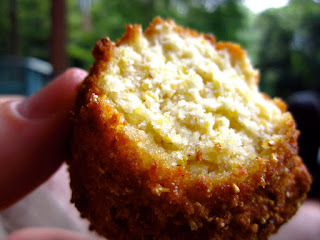 and gluten free hush puppies! The funny part about this is that these are the pictures from last year (I did not have a camera with me) and I realized that we made the same thing just under a year ago! Tony's dad is such a great fisherman and he caught a bunch of fish the day we arrived! Huge score for this family! The hush puppy recipe is here. 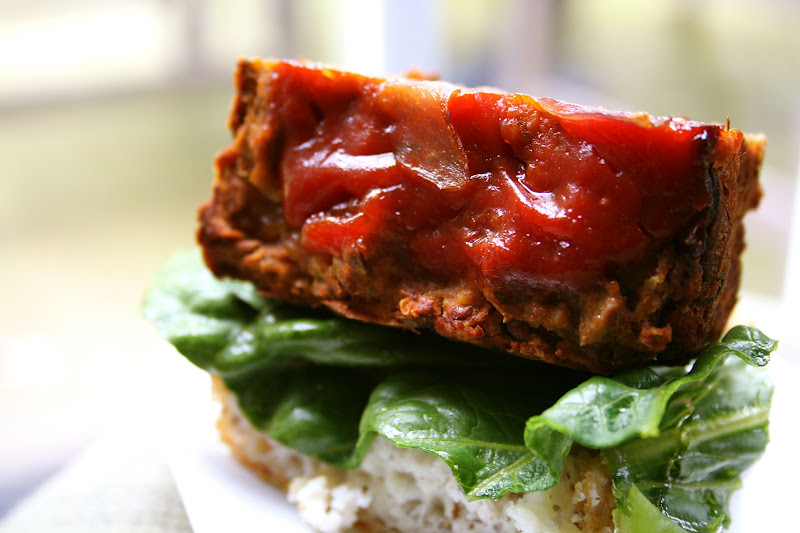 I made meatloaf for the guys the other day and decided that was my chance to try my lentil burgers in loaf form. 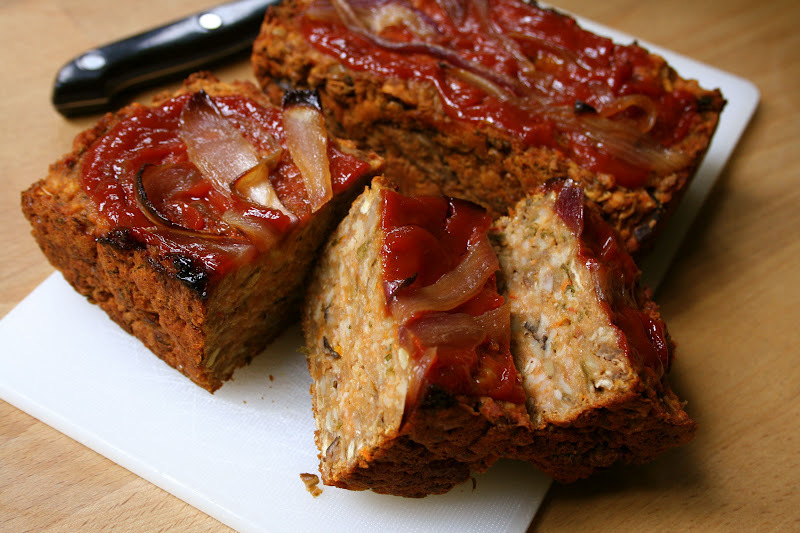 Our meatloaf recipe is Martha Stewart's Classic Meatloaf with the addition of sautéed onions added to the top in the last 30 minutes of cooking. So, I made my lentil burger mixture, added 1/2 cup dried shitake mushrooms to the lentil pot while it boiled, put the "burger" mix in 3 miniature loaf pans, covered them in a mixture of 1/3 cup ketchup mixed with 1 tablespoon brown sugar and some sautéed red onion. I baked the miniature loaves for 1 hour. I LOVED the crispy exterior of these! YUM! The sweetness for the topping really complimented the loaves. Place the lentils and mushrooms in 4 cups water. Bring to a boil. Reduce heat and simmer for 20 minutes or until done. Poor off excess water. Allow to slightly cool. Next add oats through pepper to the lentils and mix thoroughly. Place in the refrigerator and allow to cool completely. When ready to make, divide the mixture into 3 miniature loaf pans. 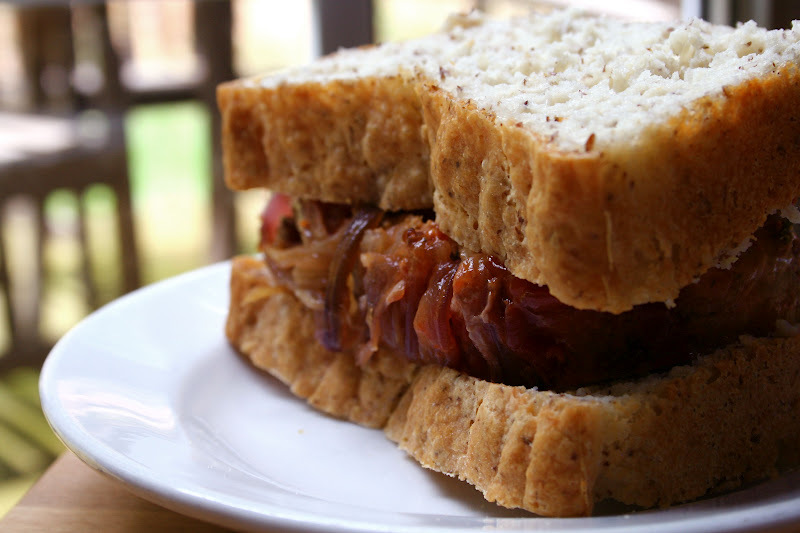 Top the uncooked loaves with ketchup mixture. Bake at 400 degrees for 30 minutes, add the onions and bake an additional 20-30 minutes. Enjoy the time with Tony. I know you miss the boys, but take advantage of the time together (and I know you will). Love the idea of the mushrooms in the lentil loaf. Duh. Happy Monday my friend! can i come crash your time with tony? Just for the amazing food of course. He won't mind , right? haha. gluten. free. hushpuppies! you're teasing me!! sounds delicious! thanks for sharing! I have such great memories of spending summers with my grandparents - both sets, one here on the Oregon coast and one in Hawaii - and you know your boys are lucky to spend time with them! I need to try this, I cannot wait to try this! :) ...and that bread looks so good... I want that whole sandwich! 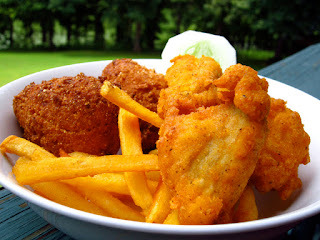 Oh, and hush puppies make me happy. I'm glad you had a nice Fathers Day! this recipe is great. as a vegetarian, everyday is meatless for me haha. i'll have to try this recipe! Yay for a great Father's Day Sarena! I bet it's weird being away from the boys. :) Um your recipes never cease to amaze me. YOu are one ambitious girl in the kitchen. 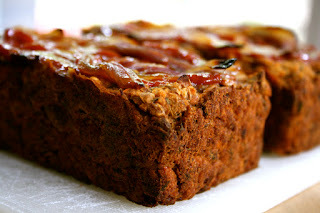 :) Lentil loaves- amazing. Enjoy your "boring" time!!! Ha ha. First off, I feel the exact same way any time my boys go off to stay with their grandparents...it is kind of that bittersweet sense of knowing that they will be having a blast but that i will still be missing them. Now that Lentil Loaf recipe is totally going into my oven this weekend! This is PERFECT!! I have been thinking about something like this! I love the flavors you've combined!! It's very trouble-free to find out any topic on web as compared to textbooks, as I found this paragraph at this website. I Love A Big Muffin Top!